Three Centuries of American Prints: from the National Gallery of Art, National Gallery of Art, Washington; National Gallery in Prague, Prague 1; Antiguo Colegio de San Ildefonso, Mexico City; Dallas Museum of Art, Dallas, 2016 - 2017, no. 41. "Lithographs and their Printing: An Interview with Mr. Frederick Goulding." The Studio 6 (1895-1897): 86-101, repro. Belleroche, Albert. 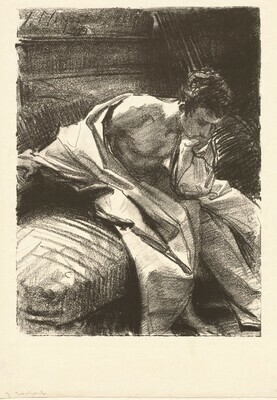 "The Lithographs of Sargent." Print Collector's Quarterly 13 (1926): 30-44, repro. Dodgson, Campbell. "Catalogue of the Lithographs of J.S. Sargent, R.A." Print Collector's Quarterly13 (1926): 44-45. Jones, Karen F. "American Artist Prints." The Quarterly Journal of the Library of Congress 23, no. 1 (January 1966): 56-59, repro.